Incident IQ’s first update of the fall season is here. Users will find a number of requested features—like the ability to conduct feedback surveys, as well as to create custom models, issue categories and issues. For Infinite Campus districts, our Infinite Campus app integration has been significantly enhanced, including the ability to sync grade and home room information to user profiles. 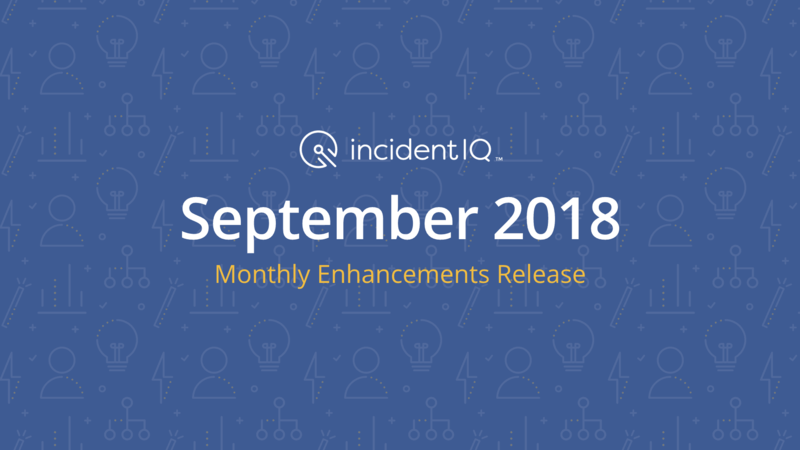 Read on to learn more about the changes found in our September update, our upcoming webinars in October, and an opportunity to receive a $25 Amazon gift card by providing a review of Incident IQ on G2Crowd.com. Incident IQ has added the ability to conduct feedback surveys after tickets have been resolved. Administrators can create surveys and display them to users via email or through Incident IQ. Surveys can be sent to a sample size of users of their choosing, or to every user who has a help ticket resolved. Reports are built into Analytics Explorer to allow leadership to gauge IT team performance over time by technician or location. This feedback and surveys functionality will be available to all Incident IQ districts. A frequently-requested feature that you’ll find in this new update is the ability to create custom models, issue categories, and issue types. This allows administrators the ability to add new hardware and issue types, as well as edit the names of devices to fit their district needs. Enhanced visibility options give admins the ability to display or hide certain model types from specific user categories as well. Incident IQ’s Infinite Campus integration has been enhanced, with dramatically reduced sync times, and the ability to import a greater amount of Infinite Campus data fields into Incident IQ. Calendars, homeroom, and grade levels can now be synced into Incident IQ. Current users of the Infinite Campus integration will automatically receive the update as part of this release. Incident IQ is now on G2 Crowd—the software solutions review platform. G2 Crowd is looking for Incident IQ reviews from agents and administrators. Reviews take approximately 20 minutes to complete, and reviewers will receive a $25 Amazon gift card upon successful completion of the Incident IQ review.